The official handover of the newly refurbished Ebeneser Chapel will take place on Wednesday 5 October. 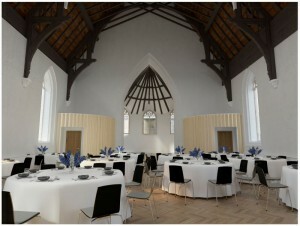 There has been a stunning transformation of this Grade 11 listed building,being faithful to it’s architectural heritage as well as creating social spaces which will serve the Diocese, St. David’s Cathedral and the wider community for many years to come. The official opening is scheduled for Thursday 8 December, the Feast of the Immaculate Conception of the Blessed Virgin Mary, Patroness of the Diocese of Cardiff. A number of events have been booked between October and December. There will also be a number of ‘Open Days’ when parishes and schools will be invited to enjoy the facilities and plan the use which they can make of this outstanding centre at the heart of the city. The first external event is a Dinner and Concert for an excellent charity called ’Music in Hospitals’. This charity is based at the Royal Welsh College of Music and Drama. It aims to improve the quality of life of adults and children with all kinds of illness and disability through the joy and therapeutic benefits of live music professionally performed in hospitals, hospices, Day Care Centres, Special Schools, and nursing and residential homes throughout Wales. The work of the charity provides an invaluable support for both patients and families,friends and carers as they face the implications of sometimes long term if not terminal illness. The star of the evening will be the soprano Rebecca Evans who will be joined by the Alex Goodyear Trio, Bone Appetite a trombone quartet and Tim Rhys-Evans of Only men Aloud. The evening will be compered by the BBC’s Beverley Humphreys and will include a champagne reception and three course meal provided by our in house caterers Spiro Borg. All the artists are giving their services free in order to support ‘Music in Hospitals’. Further details of the program of events connected with The Cornerstone will be posted on the Diocesan website which has it’s own page dedicated to the development of this important facility in the life of the Diocese.